I can respect how long Ilhan Omar and Rashida Tlaib have stuck with BDS thus far in their congressional terms. And I can also appreciate Tlaib skipping the AIPAC sponsored tour of the West Bank. Let’s hope they continue to hold the right positions on this issue and don’t falter. Being “pro-Palestine” is not enough. I put it in quotes because supporting our Palestinian brothers and sisters cannot be reduced to some isolated policy position. This is a matter of basic morality, even basic humanity. Supporting Palestine and opposing Israel just means you meet the minimum requirements of being a decent human being. I mean, that’s the standard I have for non-Muslims. For Muslims, the bar is way higher. If you’re a Muslim, you had better oppose Israel and support Palestine through BDS, otherwise you’re most likely a two-faced, paid shill and should be called out for it constantly for the rest of your life. So, I’m not going to swoon with admiration when a Muslim does the most minimal thing possible, i.e., not sell out. I will tip my cap, but swoon I will not. Not selling out to Zionists is the minimum expectation, so congrats to Omar and Tlaib for getting this far. Too bad they have to constantly ruin it. This is so wrong. And so stupid. Imagine how unprincipled and morally confused you have to be to encourage enlistment in the US military just because it gives you a political opportunity to be pro-LGBT. Either this is just degenerate political opportunism or Ilhan and Rashida really do care about cross dressers that much. Frankly, I don’t know which one is worse. But wait a second. Explain to me why Omar and Tlaib have to go out on a limb for trannies in the first place. 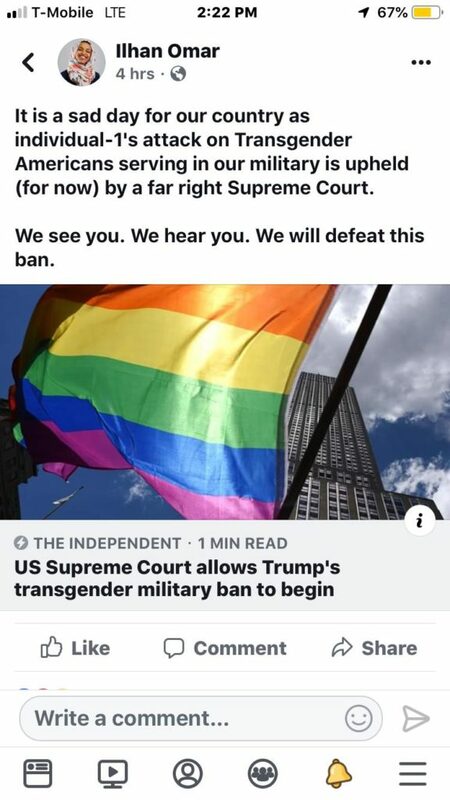 Explain to me why they have to go against the Supreme Court of the United States of America on the issue of whether men can dress like women in the military. Explain to me why they are essentially supporting military enlistment. Guess they’re not as anti-war as some would like to think. 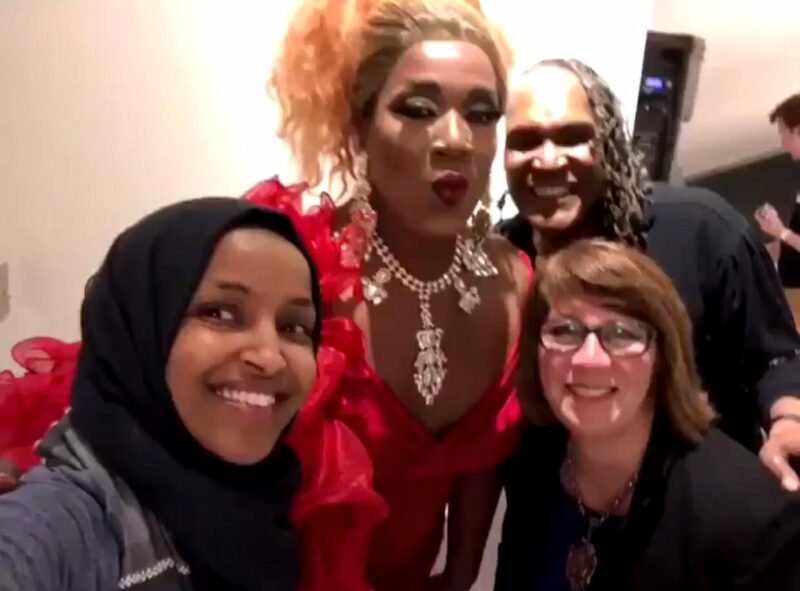 Ilhan taking selfies with her transgender network. Let’s put aside for a minute that transgenderism is completely and categorically contrary to Islamic ethics. 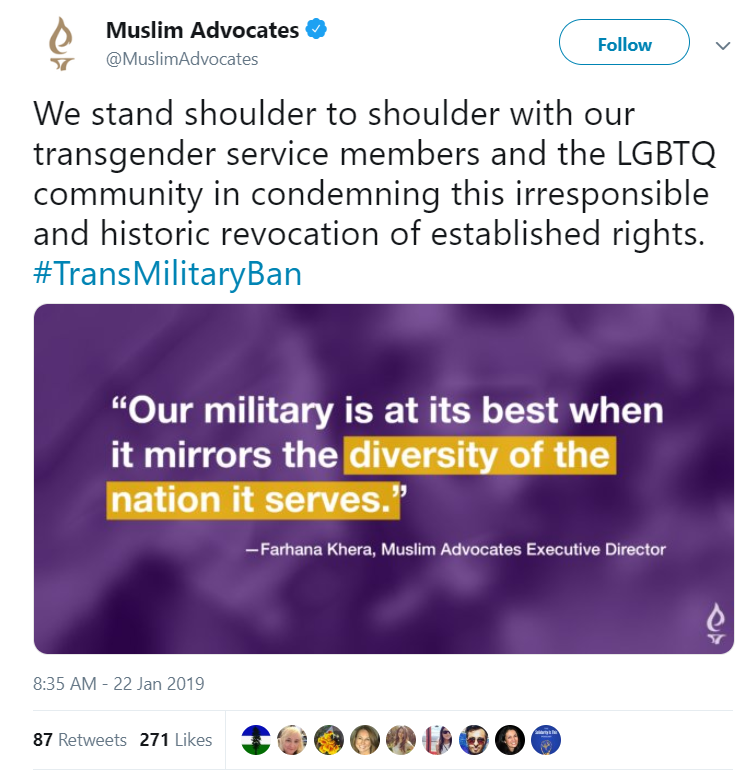 Even from a practical policy perspective, even from a purely political career perspective, why oh why do Omar and Tlaib feel compelled to fight for the “right” of trannies to join the military? There are plenty of socially more conservative dems who don’t feel compelled to die on this hill. So it’s not like Omar and Tlaib would be stepping out of their party’s good graces. And even if they did, they already have done that by being pro-BDS. So how does this make any sense? And it’s not like there would be social backlash from constituents if they, you know, maybe not tweet rainbow flags every two minutes. And the effect on some American Muslims is exactly as you would expect at this point, with some of them viciously arguing about how Muslims must support trannies in the military, as if this were the 6th pillar of Islam. Defending LGBT and the US war machine in one tweet. They should make it a hat trick and defend Charlie Hebdo cartoons against the Prophet pbuh. Stupid argument. You can say the same thing about any claimed “rights.” The pro-gun lobby is constantly making this same exact argument, i.e., if we don’t stand up for gun rights, the government will continuously erode rights for everyone. It’s funny how Linda Sarsour picked up on this contradiction of supporting military enlistment but supposedly being anti-war. What a mess. This is the “leader” we are constantly told to support? What a disgrace. And of course she trots out the tired “First they came for the cross dressing sexually deviant drag queens…” argument. Give me a break. We are supposed to believe that if Muslims don’t support every new fahisha that comes along, then there is going to be a crackdown on Muslims and we are going to be thrown into concentration camps. This kind of fear mongering is extremely unethical and inappropriate and we need to blast any supposed Muslim leader or organization that is emotionally blackmailing the Muslim community with these debased fear tactics. Enough is enough. Maybe this is Omar and Rashida’s secret plan to weaken the US military. That’s it! 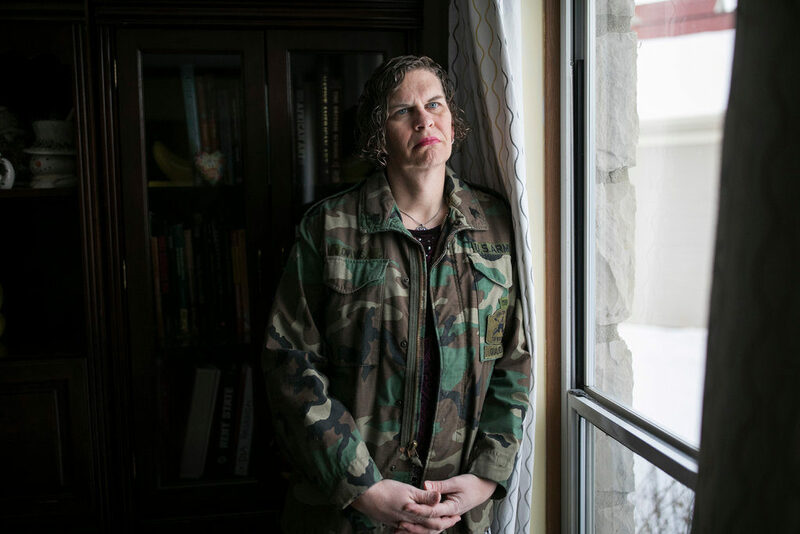 They are secretly working to undermine the US war machine by encouraging mentally disturbed cross dressers to fill its ranks. This is actually brilliant. 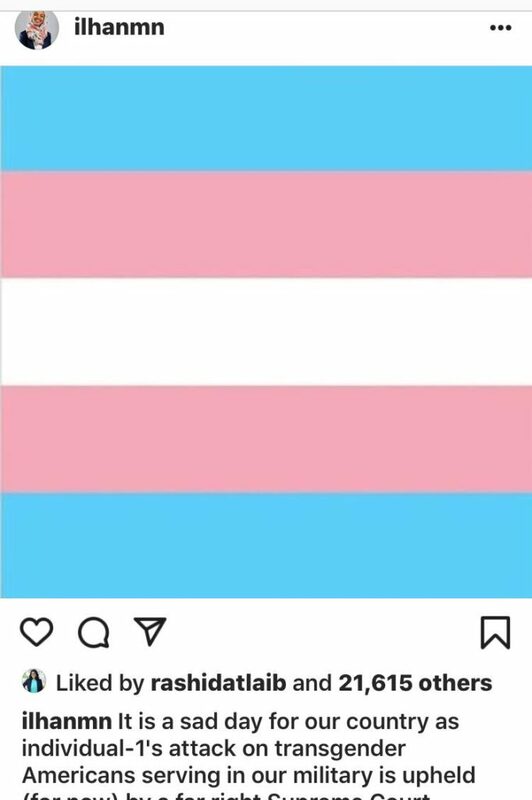 Also keep in mind that the suicide rate is already incredibly high for trans people. Nearly half of trans men attempt suicide. The suicide rate for military servicemen and veterans is also well above average. 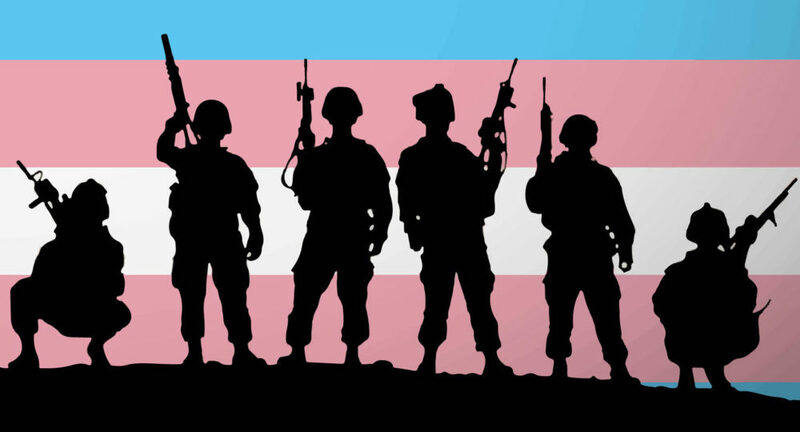 What about the suicide rate for those who are both trans and servicemen? Well I haven’t seen any data, but it has got to be through the roof. By demanding that trans serve in the military, Omar and Tlaib are essentially sentencing these men to death. If that’s their secret intention behind all this, it’s pretty sinister. I mean, I want these people to get help and psychological counseling, not commit suicide. But maybe Omar and Tlaib don’t play that. This type of unqualified pragmatism is the road to hell. The help of Allah is better then anything they can do. Daniel you seem to be God’s gift to earth! Are you the Mehdhi? Maybe, because they think it’s somehow less sinful than being gay (or not sinful at all), so it’s acceptable for LGBTZXCVNREMRWNB+ virtue signalling? No, just feel that Daniel is the Mehdi… Aren’t you inspired by his words of wisdom? Ilham and Rashida appear to not have read the verses 80-84 of Surah al Araf in the Quran. Because if they had they would not hold the position that they do-this or they are openly disbelieving.